Craft a Smile! | Craft a Smile! Author Archives: Craft a Smile! … strips of the paper used on the card front were glued inside to cover the ink smudge. I actually liked it better that way! I admit this was not a watershed moment or even the worst mistake I have ever made when creating. However, it caused me to think about the pressure we put on ourselves as artists and crafters; often we are afraid to try new things because we may reveal our imperfections. The iconic painter, Bob Ross, famously said: “There are no mistakes, only happy accidents.” Think of mistakes as opportunities to grow and become a better and more confident artist. Be fearless, try everything and expect to screw-up occasionally! How do you fix your crafting errors? I’d love to hear about it so please comment and share below! Categories: Art, Card Making, Crafts, Paper Crafts, Uncategorized | Tags: Shaker Card | Permalink. 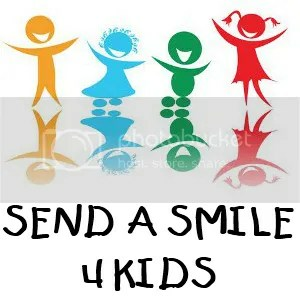 You may have read my recent post about Send a Smile 4 Kids (visit them Here ). They are a wonderful organization that solicits handmade cards, which they send to, and are used by, hospitalized children and their caretakers. They have frequent card design challenges, with vendor supplied prizes, and I decided to join the fun since I’ve never entered a design challenge before! Prima’s Julie Nutting doll stamps are adorable and I have two of the original designs. The newer released dolls have names, but this one is just known as 91043 – perhaps a doll Social Security number? (haha) The images are 6″ tall so the tag card is 8″ x 4″ and required a custom envelope. Recent doll stamps are available in smaller sizes and even have clothing and accessories that can be stamped separately; some matching die cuts are available. I stamped the doll once and colored with Spectrum Noir markers. I stamped again on patterned paper and green cardstock, cut out the dress and attached with an adhesive runner and pop dots at the bottom between the dress layers. Other elements were punched using a variety of papers. Spellbinders nesting dies created the base for the stamped sentiment, which is from Reverse Confetti. The headband was dotted with Liquid Pearls. Here is another version, slightly easier because I used paper that already had a border so I did not need to cut quite so many embellishments. I cut flowers out from that paper and added on top of the flowers that were printed. Do you have any Julie Nutting doll stamps? Let me know in the comments your favorite ways to use them! Today I sent handmade cards to Lasting Hearts, a charity born from the emotional pain suffered by Kimberly Saldana, founder of Lasting Hearts, after her miscarriage. She was greatly helped by a book that was given to her, Angela Miller’s You are the Mother of All Mothers, and she is determined to get this book into the hands of other mom’s who have lost a child. Lasting Hearts raises money to buy the books, and doctors distribute the books to their patients. She also collects handmade cards to give to the book recipients. It’s such a simple gesture really – but it must be quite healing to receive this gift, from a stranger with a caring heart. My cousin and her husband recently suffered a miscarriage. They were very excited to be having a second child and were devastated by their loss. Mourning a miscarried child seems to come with a different set of rules though since there is no actual birth, no photos, no name and no funeral; almost as if the child was not “real”. There are no memories of the child to comfort us and talk about, which complicates the grieving process and also makes offering sympathy very difficult. So, we are being given a wonderful opportunity to offer a supportive hand to these parents by giving a donation if we can. The link to the fundraising site is here The charity also has a facebook page if you would like to learn more. I’m sharing photos of the cards I created, six each of three styles. I struggled a bit to keep them simple with subdued colors, neither of which is my typical style! It seemed logical to avoid bright colors and bling. It took about three hours to create all 18 cards, including design time, so about ten minutes each. One of the easiest cards to create is to stamp a design and then use an embossing folder – very quick and easy. I used Colorbox Paintbox ink pads, Pastels and Brights, for the first card set. Round medallion stamps were used with a we r memory keepers medallion embossing folder. I rounded the bottom edges for a softer look. The second set of cards uses Recollection pale gray cardstock and stamps from Big Red Rubber Stamps (in the center) and Hot Off the Press, both of which are called Peacock Feather. I heat-embossed Memento Sweet Plum, London Fog and Summer Sky with Ranger Clear Detail embossing powder. Since I had no sentiment stamps that seemed appropriate, I created one on my computer, printed and cut out with Spellbinder’s oval die and inked the edge with Sweet Plum. I used the same sentiment on my third set but cut with a Spellbinder’s scalloped oval. I embossed the cardstock with a Darice tree embossing folder. Will you be making cards for Lasting Hearts? Please let me know in the comments and if you would like me to post photos of YOUR cards, let me know!